At Monet Aesthetic Dentistry, we believe in order to provide the highest level of care, you need to have the right tools, which is why we make it a point to always utilize the latest dental technology in our facility. With the instruments listed below, we can ensure that our patient experience is fast, comfortable, and delivers consistent results. You’ll be amazed by how your appointment will seemingly fly by, and you’ll also learn so much about your dental health in the process! To learn more about our technology and experience the benefits in-person, give us a call. Many dental problems show early signs that can’t be seen by the naked eye, which is why we use X-rays every day. We’ve upgraded to only using digital X-rays. Compared to traditional film, they are lightning-fast, don’t require toxic chemicals to be developed, and they also emit up to 80% LESS radiation. Storing and sending the images can be done in a flash as well, making filing for insurance or referring you to a specialist a breeze. 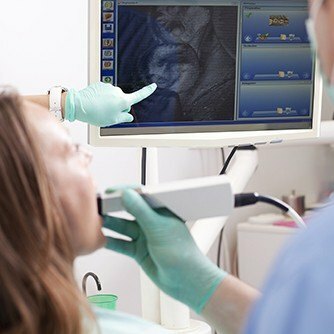 Intraoral cameras help us take some of the mystery out of your dental visits. 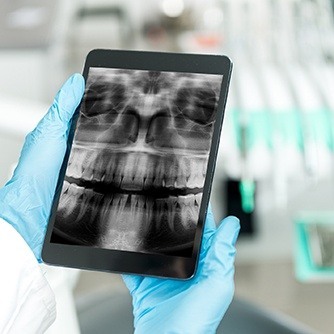 This small, pen-sized device captures high-resolution images of the teeth and gums that we can instantly show you on a large chairside monitor. Using them, our team can spot dental issues even sooner, and you’ll literally gain a whole new perspective on your dental health, making it easier to understand what Dr. Metzger is talking about. Lasers might seem extremely futuristic in the context of dentistry, but dentists have actually been using them since the mid-90s! With them, performing the most sensitive periodontal (gum) procedures is easier than ever. 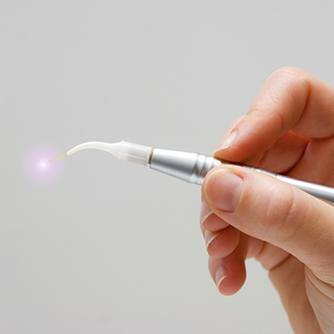 Using its concentrated beam of light, Dr. Metzger can instantly eliminate bacteria located deep below the gum line and even remove infected tissue, all while reducing discomfort and bleeding to practically nothing. The instrument creates little to no heat, noise, or vibration, making any procedure a comfortable experience for a patient. Finding and treating tooth decay as quickly as possible is one of the most important things our team does every day, and with the DIAGNOdent laser, we’re better at it than ever. 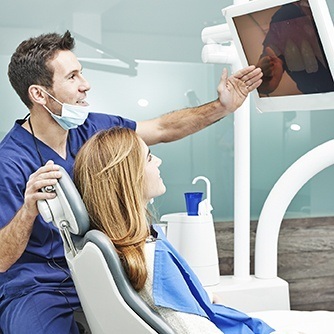 This system scans enamel using a beam of light that’s able to find even the slightest signs of decay, including ones that would normally be missed by a traditional exam. With this knowledge, we can apply conservative treatments to fortify at-risk teeth and stop many cavities before they even start.